Wolgan Valley with Donkey and Wolgan Mountains in the distance at Sunset. Wolgan Valley is the part of Gardens of Stone National Park. Its rock formations are sensational, its lookouts and bushwalks afford sprawling views, and it is home to a wide array of birdlife and wildlife. This image belongs to the travel and nature stock photo library. This stock photo of Wolgan Valley at Sunset is available for licensing for commercial and editorial uses including websites, blogs, books, magazines, brochures and advertising. Restrictions may apply for images which contain third party copyrighted material or sensitive subjects. Photos of artwork are for editorial use only. 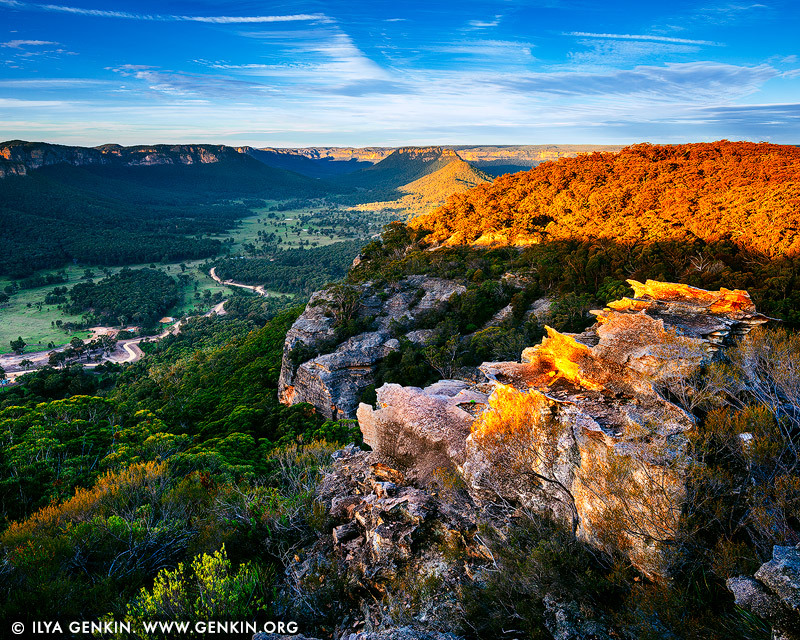 This image id WOLGAN-VALLEY-0001 of Wolgan Valley at Sunset, is copyrighted © by Ilya Genkin. This is not a public domain image.